This weekend it worked out that after ballgames on Saturday, I had some time in the evening to scrap and then also again after our game on Sunday. 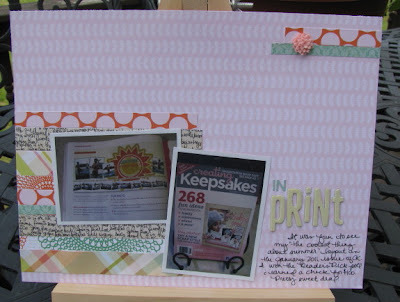 Since Saturday was National Scrapbook Day (yes, there is a "holiday" for scrappers! ), Studio Calico had posted some great challenges and sketches. 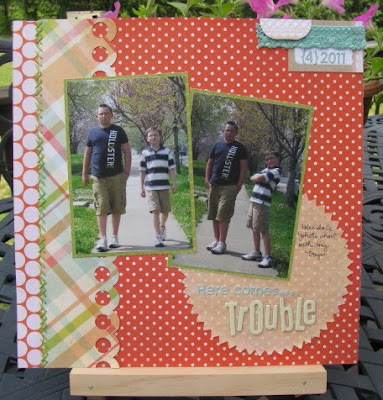 Armed with my new May Studio Calico kit - Lawn Party - and a fresh batch of printed photos, I went to work. I was quite productive in my short spurts of time. 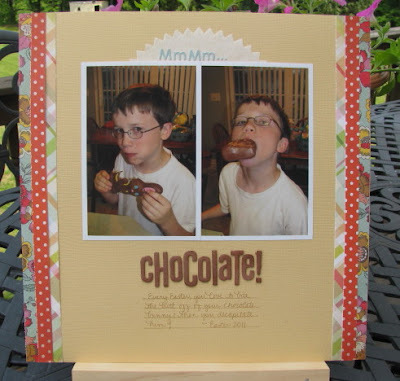 My first layout, "MmMm...Chocolate" is based on one of the sketches. I love the simplicity of this page. I used mist (Pony) to change the color of the Thickers in the kit. I wasn't sure what to do with the Fancy Pants Filter Paper accents, so I used half of one peaking over my photos for an embellishment and to back part of my title. "The Big Hunt" is also based on a sketch. I switched it up a bit though. 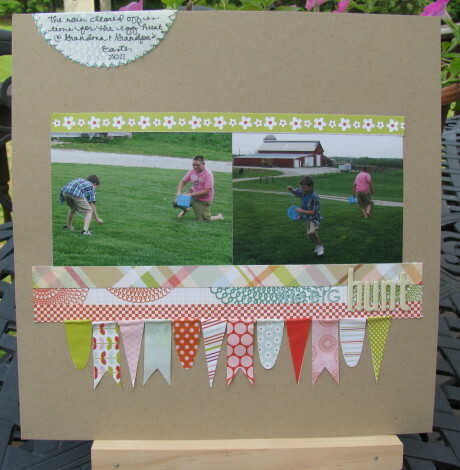 The scalloped border on the sketch was altered and I used up the whole pack of Pebbles flags from the kit. Again, I used the filter paper for my journaling. This time I backed it with a design hand cut from one of the Studio Calico papers. In January, I had a layout appear in Creating Keepsakes after I won their Reader's Pick Poll. Of course, I had to scrap that! This layout is based on another sketch. I switched the orientation from portrait to landscape though. The sketch I used for "Crazy" was 12x12, but I worked it into an 8-1/2x11 layout. I actually REALLY disliked the floral paper I used here, but once I put it up against the pictures, really liked the final layout. My sister had taken these shots of Reese making her crazy face. I love this kid! Oh look...another Reese layout. In this photo, she seriously looks like I did as a toddler. This layout came together quickly thanks to another SC sketch. I decided to raise up my circles under the photo with pop dots. I also added the Pebbles flower brads to random circles. Photos of Reese hunting eggs worked perfectly with the kit, too. I didn't have to use a sketch for this one. I think my sister might get aggravated with me for stretching Reese's curls out to give her BIG HAIR. 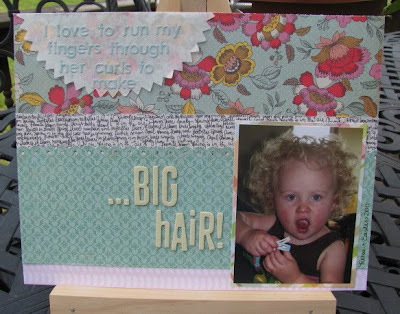 But, she's just so cute... For this layout, I pretty much just pieced scraps together. I had used up almost all of the embellishments in the kit. The filter paper and Basic Grey alphas doubled for journaling/subtitle. Finally, I did one more page. Again, I pieced scrap papers together and used the remaining embellishments. These photos were from the photo shoot I had with the boys during spring break. This is the first time I have used up a Studio Calico kit since subscribing in January. I feels great! Amy, these are gorgeous layouts! This looks like a fun kit! I almost didn't recognize your boys in the one picture, they are getting so big! You can seriously stretch a kit! Go, Amy! I love seeing all that you did with the SC kit. Amy, these are such lovely layouts! It's so fun see you creating girl layouts! I love the one you made of Reese with all of the circles. 3 Days of Baseball - YAY!